Honor View 10 can it replace my Samsung Galaxy Note8? Like the title of the post says, can the Honor View 10 replace my Note8. Don't get me wrong I love my Note8 but i did not enjoy the price of it, just short of a €1000.00. I have had Samsung Galaxy note's since Note3 and while always expensive I considered them good value for money for what the can do.,But not anymore in my opinion. Now I am thinking if this phone is good I may just sell my Note8 while it's still worth a half decent amount and just use my Honor for all mobile duties. Without worrying about how much it will cost if I damage it. So I will report back in a few days and give you my impression of the Honor View 10 against he Note8. I am looking for to hearing your opinion. I sold my Note 8 and got the Pixel 2 XL and I don't regret it at all. I picked up the Mate 10 Pro last week and now I'm trying to decide if I should keep it or the Pixel. Don't get me wrong I like my Pixel but I miss having an IR blaster on phone. Especially when the kids lose the remote control. And the battery on the the Mate 10 is excellent. It easily outperforms the Pixel. The view 10 is excellent, and pretty close to the note 8 except that it doesn't have a stylus, curved display, questionable updates, warranty support and security. And the note 8 camera is generally better though not twice as good. If those things aren't important then the view 10 is quite an excellent choice for those looking to save money,and not really far behind the note 8. In some things, it probably does better than the note 8 especially in the performance category. Been using the Honor View 10 for the last five days now as my main phone and am really impressed for the price it costs. I now know for sure that I won't be buying any more phones of a thousand euro or there abouts in the future. The View 10 has really opened my eyes as to what is available for a lower price without sacrificing too much. The Note is a great phone but too me not worth the price. I will get this remark out of the way first, Honor really needs to sort out battery management /notification problems. Its an absolute ****storm of a mess and took me way to much time to get all my apps that I want notifications for working correctly. I have even given up with a couple of Apps as the battery optimisation just kills them dead no matter what I try. Price Is fantastic value for money. Screen is very good, may be only 1080 but its crisp and sharp with good viewing angles.Best of all its a flat screen. I am growing tired of curved screens. Battery life is really good. Even with battery optimisation disabled. Easily get 2 days out of it. Camera so far has been good so far but, greens are a bit unnatural. Also can't comment on night shots as I haven't done any. Design wise it's a good looking phone and well built. Fingerprint scanner on the front is lightning quick and being able to use the fingerprint scanner as the back and home button doing away with on screen keys is really useful. Another neat thing I have discovered is I can turn my phone completely off at night and the alarm will still go off in the morning, it restarts the phone after the alarm has sounded. Biggest shock is yes this phone is going to replace my Note8. My Note8 is now up for sale. Its goodbye to ridiculous priced phones for me and hello to sensibly priced alternatives. If anyone has any questions let me know, will try and answer if I can. cert15z and Wildo6882 like this. Have you figured out how to reduce icon size? They look huge. Only with a custom launcher. But I don't find hem huge, I have my home screen set as 5x6. Coming from LG and Samsung. When you set view mode to small. It can reduce screen size. Also, you need to organize the icons manually. No option to auto. 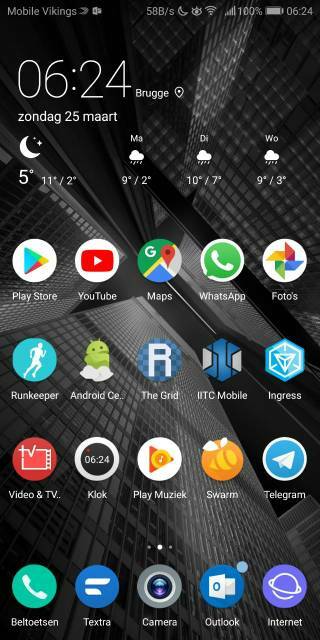 EMUI lanucher comes long way. Well I cancelled selling my Note8 and sold my Honor View 10. Couldn't deal with the software. Can you go more in detail about things you dislike? I'm getting use to software as we speak. The screen on time is amazing. Before buying this phone I had my eyes on Sony Xperia XZ2 but they're $699 unlocked, without headphones jack. The notification was a mess, sometimes a notification would arrive other times not. Battery optimisation kept killing any non preinstalled Apps and even nova launcher wouldn't run properly, EMUI kept saying there was a system crash. I really could not be bothered with it. Honor make some great hardware, but the software is atrocious.